Please register below to sign up for charters. DO NOT register for courses or club dives on this form. Please Fill out the Below Information to Register for your Event. Please note: You cannot register for multiple charters in the same registration. Each dive requires a separate form entry. We have good quality Fourth Element Fleece to ensure you stay warm. This is on a first come basis as it is included for free with rentals. Computers or a bottom timer and tables are required for all dives beyond 60ft. Based on a first come basis. There may not be enough computers for everyone. Please reference the size chart on the right. Accurate height and weight measurements in IMPERIAL allow us to put the right gear together for you. Yes No, I will need transportation and will share in gas costs. If there is not enough transport for everyone, I might be able to borrow a vehicle or am prepared to help rent one. We can rent vehicles through UVic for a cost of about $10 per person including gas. Open Water Diver with RECENT cold water experience (your log book may be required for proof of experience). If you do not have cold water experience, we encourage you to take part in a club dive. This chart is a rough guideline to assist us in preparing gear before dives. If you don't fit into the chart perfectly - don't worry. We have a wide array of drysuit sizes and brands that can easily fit almost anyone. Please note this is for local diving with the equipment we use. 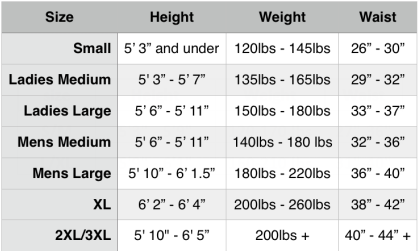 This is a rough estimate - all body types are different.